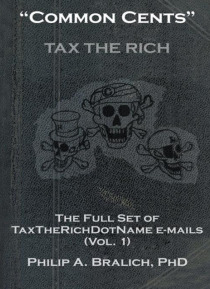 The TaxTheRichDotName e-mails evolved as an effort to draw attention and popularize the authors view of a quick and easy solution to the problem of income disparity and the distribution of wealth in the United States today. Specifically, that solution is to obviate the need for all of Marxist (both sides, communist and capitalist) idealism and all of aristocratic excess via movement to tax the ric… h thoroughly, profoundly, repeatedly, and punitively via the vote until the wealthy sit up straight, fold their hands on the table, admit they were wrong, apologize, and put the money bank. Votes, not money, move the US system, and voters, not the wealthy, are the true authority. There is no need to kill the aristocrats and no need to oppress the poor. All that is required is to tax the rich.